In house design, drafting and 3D modelling using state of the art Autocad Inventor. Acceptance of customer files and data in its native format. Design from concept to manufacture of the finished part. Cam programming from models and drawing using Inventorcam. 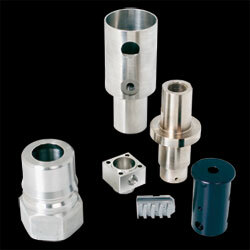 Our CNC machines turn 280mm diameter by 450mm between centres. Automatic CNC turning machines with sub spindle, cross drilling and milling up to 65mm bar diameter with magazine bar feeds. CNC Sliding Head Machines from 1/16" to 32mm diameter with sub spindle, cross drilling and milling with magazine bar feeds. Full inspection facilities with quality control accreditations to ISO 9001:2008. The new Puma 2600 lathe provides increased accuracy, repeatability, performance and process reliability. 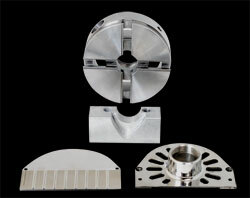 The machine has a 12" chuck with bar capacity of 76.2mm or up to 376mm from billet. With a bed length of 760mm has the capability to turn 500mm between centres with face and cross milling/drilling on the Y axis. 3 x 3 Axis CNC milling machines with Siemens and Fanuc controls having a machining envelope of up to 510mm x 435mm x 732mm (XYZ) with the additional 4th Axis capabilities available. 4 x CNC Sliding Head machines with sub spindle, driven tooling, Mitsubishi Control & Bar feed; has up to Ø32 bar capacity and component length to 500mm. 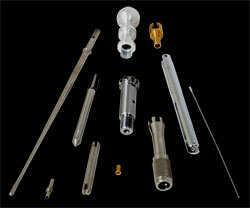 Up to 5 Axis machining, of small complex parts with the ability to work “Lights out”. 2 x CNC Multi Axis, twin spindle, twin turret machining centres with Fanuc control have the ability to produce one hit complex components from up to Ø65 bar capacity; having up to 7 axis and full driven tooling capabilities. Again with the ability to work “Lights out”. 1 x CNC Superswift 52 Auto gives up to 52mm Ø bar capacity x 150mm component length, also benefiting from “Lights out” operation. 1x Colchester Triumph Centre Lathe with gap. 500mm swing x 600mm between centre's. 1x Jones and Shipman 510 surface grinder 18"x8"
It will turn 3D CAD files into functional durable 3D models that can be discussed and tested. It uses ABSplus modelling material, a production grade thermoplastic that is durable enough to perform virtually the same as production parts. The models will have customer proven toughness – from commercial sprayers tested at pressures up to 60 psi, to final parts on M1 tanks normally machined in aircraft-grade aluminium. Models are printed from the bottom up with precisely deposited layers of modelling and support material. There’s no waiting for models to ‘cure’ they are ready for support removal right from the printer. The supports are simply snapped off to reveal the final model which can then be drilled, tapped, sanded and painted. Build size 254 x 254 x 305mm, layer thickness .254mm or .330mm of precisely deposited ABSplus model and support material. The printed models will help you check form, fit and function and correct errors before your product goes into production. 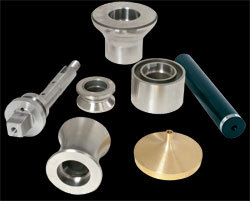 Versatile enough to produce functional models, molds, patterns, customised tools and fixtures.